We have seen Nebuchadnezzar vacillate from being a king who honored the God of Daniel (or Belteshazzar), Shadrach, Meshach, and Abednego, to treating their faith in the same God as reprehensible. Why? Because their refusal to worship the image of the king confronted him with the fact that he was just a man who only ruled because it was God’s will. But he did not listen to the condemnation of his heart, and sent Daniel’s friends to the furnace. Nebuchadnezzar believed himself to be greater than his conscience, of more importance than God himself. Like King Nebuchadnezzar, we would do well to listen to God speaking in our hearts. When we do so, we discover two things: that we are less than God, and that God is greater than our consciences. We may have confidence that God forgives, even when our hearts are troubled. This was Nebuchadnezzar’s mistake, as well as the error of those in the synagogue, angry at God’s Christ. They refused to listen to God, driving him out so that their wills were all they could hear. But God is merciful toward those who heed him, keeping his word, abiding in him. Prayer: Father, be merciful to me, a sinner, for the sake of your Son, Jesus Christ. Amen. 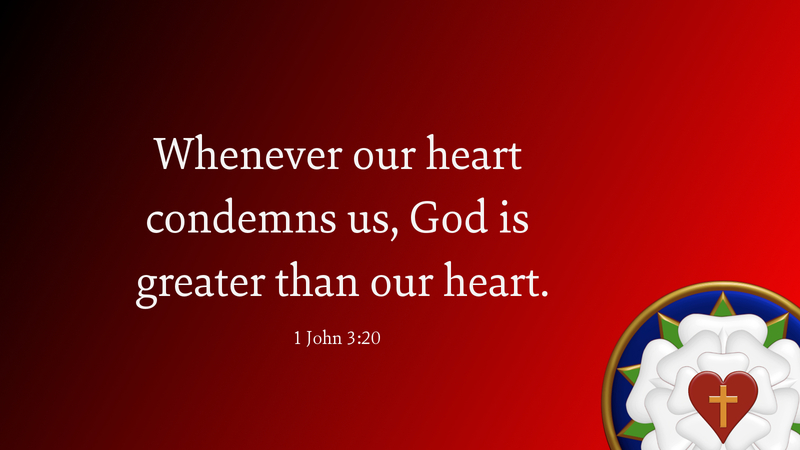 • Archives of NALC Devotions • Original image courtesy of Sola Publishing • Click any of our Scripture graphics to enlarge and save for use in bulletins, newsletters, blogs, and websites.